Few vehicles can make a heart race like a Ford Mustang can. Over the model’s long lineage, a knack for spawning legendary nameplates has made the title Mustang synonymous for power. 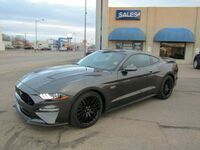 Keep reading to learn more about the 2019 Ford Mustang at Wolf Auto in Ogallala, NE. On top of its legendary roots, the model’s head-turning radiant color selection makes it pop from the rest with shades ranging from the cool-toned Need for Green and Kona Blue to the warmer hues of Ruby Red to Orange Fury. But don’t let the Mustang’s vibrant and quirky colors mislead you—there’s no horsing around when it comes to what’s under the hood. The Mustang comes in a number of flavors with different power offerings ranging from the hardy EcoBoost to the boisterous Shelby. Keep reading to find out which model is right for you in our breakdown of the 2019 Ford Mustang engine lineup. Kicking off the Mustang lineup, the 2019 Mustang EcoBoost comes equipped with a robust 350-hp 2.3-liter EcoBoost engine paired with a 6-speed manual transmission or the optional 10-speed automatic transmission. Next up on the list, the 2019 Mustang GT hammers out up to 460 hp with its 5.0-liter V8 engine paired with a six-speed manual or an optional 10-speed automatic. Topping the lineup, the 2019 Mustang Shelby 526-hp lays it all down with a 5.2-liter V8 matched with the TREMEC® 6-speed manual transmission. In the iconic car chase scene of the 1988 film Bullitt, the Highland Green Mustang GT 390 fastback catches air in the streets of San Francisco. 50 years later, Ford drew inspiration from this scene to bring us the limited-edition 2019 Mustang Bullitt. This breathtaking model features an upgraded 480-hp 5.0-liter V8 with a larger 87-mm throttle body and 6-speed manual transmission. Sporting a Dark Highland Green exterior color and red-painted Brembo™ brakes, this model brings an unmistakable charm certain to leave others green with envy.